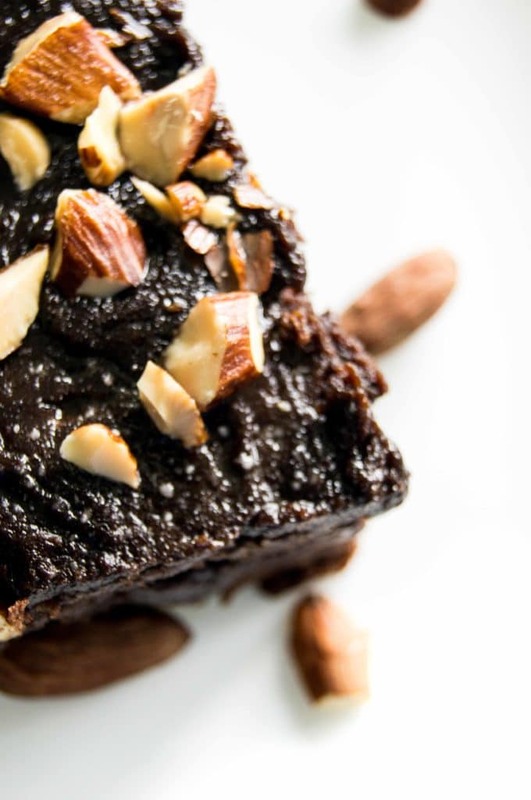 I’m super excited to share this recipe for Chocolate-Frosted Almond Brownies with you, bestie. This post is sponsored by Real Layers Baking Company. Real Layers create delicious ready-to-spread buttercream frostings, which save you (and in this case, me!) a lot of hassle. The frostings use 100% real butter, are gluten-free, and use no artificial flavours or preservatives. For this recipe, I’m using the Real Layers Chocolate Frosting, but they also have Vanilla and Maple flavours in case you want to mix it up a little bit! 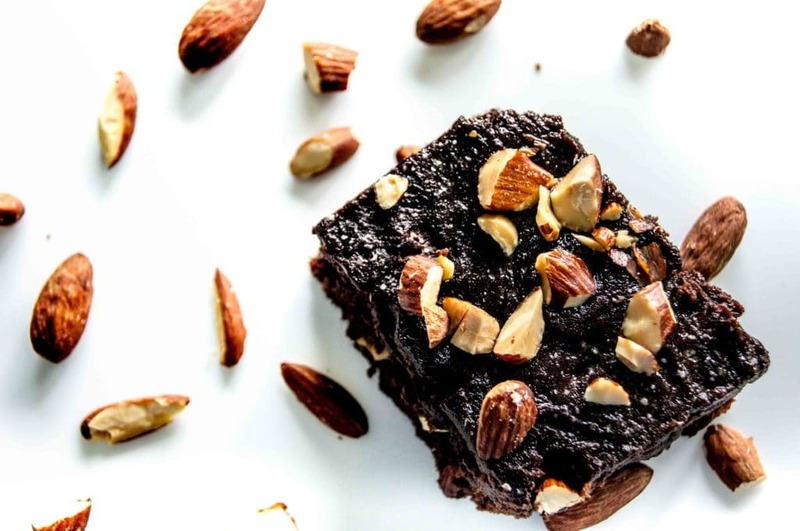 Brownies are probably the first thing most of us learn to bake as children – they’re easy, they’re delicious, and you can dress them up (or down) any way you really want to. Birthday cake sprinkles? Go for it. Chocolate frosting? It’s a classic. 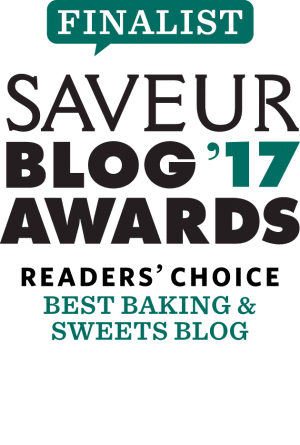 Maple-infused-almond-butter-nougat? Well, okay…that one’ s a bit more work. But you see what I’m saying…brownie recipes are something you can really make your own. 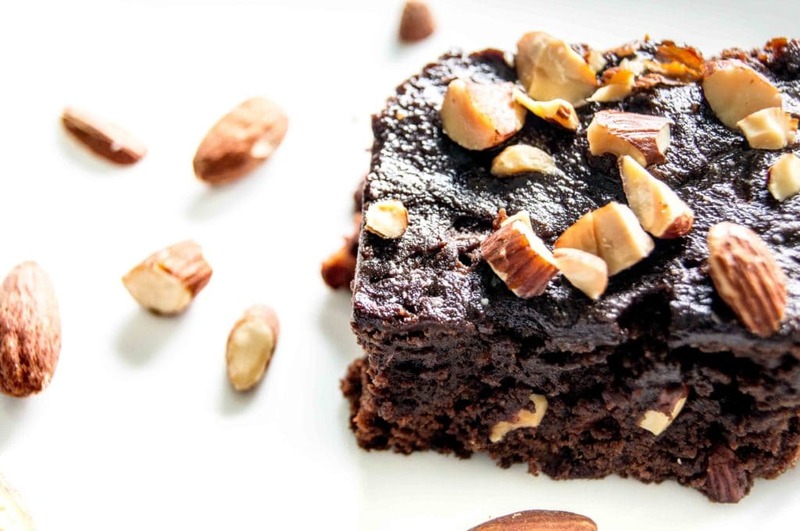 And more than that, brownie recipes hold a special place on this blog. You see, back in early-2015, I didn’t have a blog. I had never even considered writing one. But after attending a few potlucks, people kept asking me to share my recipe for Chocolate Chip Brownies. And that’s basically how Chocolates & Chai got started, I needed a convenient way to share a few recipes with friends and family located all over the globe. As always, please do comment below, and let me know your thoughts. Share this post, because everyone deserves some delicious chocolate frosted brownies this weekend. And follow me on all the social medias – Facebook, Instagram, Pinterest, and Twitter. Disclosure: This post contains sponsored content from Real Layers Baking Company. Opinions expressed are my own. 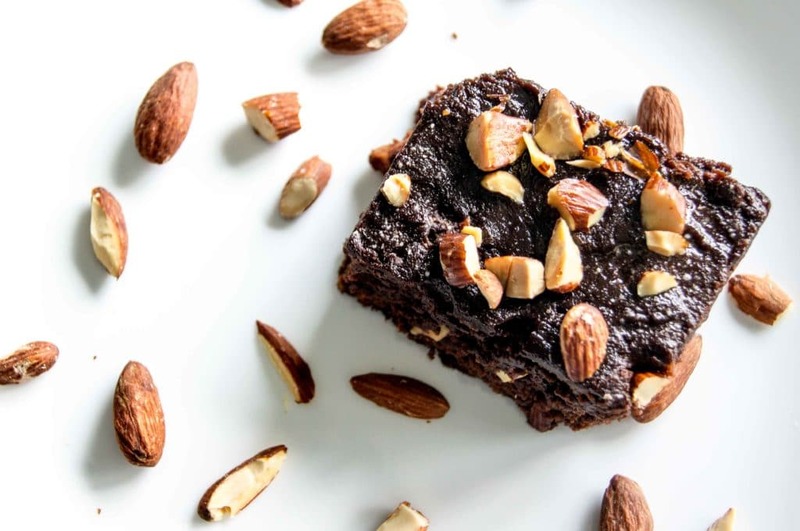 This Chocolate-Frosted Almond Brownies recipe uses dark chocolate for a deep flavour and toasted almonds for the perfect crunch. Quick and easy to make! Preheat oven to 350° F. Toast almonds on a baking sheet, tossing halfway through, until golden brown, 8–10 minutes. Let cool, then coarsely chop; set aside. Melt together chocolate, butter, and cocoa powder (in a heatproof bowl set over a medium saucepan of barely simmering water), stirring occasionally, until smooth. Remove from heat. Stir in espresso powder and pure vanilla extract. Let cool. Set oven temperature to 375° F.
Line an 9-inch baking dish with parchment paper (leave an overhang on 2 sides). Butter parchment paper. Whisk eggs and salt together. Add sugar in 3 batches and continue to whisk vigorously until very thick. Pour in cooled chocolate mixture, and mix in gently. Gently fold in flour and almonds (save a large handful to top your brownies with!) until no streaks remain. Spread batter into prepared baking dish, For fudgier brownies, bake until edges have puffed but the centre is still slightly wobbly, 22–25 minutes. For cakier brownies, bake until edges have puffed and centre is set, 25–30 minutes. Let to cool slightly, and then spread on chocolate frosting, allowing the frosting to melt. Top with toasted almonds. Remove from baking tray, and cut into whatever size portions your lovely heart desires. If you don’t have access to chocolate frosting, this recipe can be made without any frosting at all! It will still taste delicious. I made them and melted chocolate on top! OMG! This is like the best brownie recipe ever!!! They’re just so prefectly soft!!! Hi Erika! That’s awesome I’ve made the melted chocolate version too…and man, it tastes good!!! Who can resist a good brownie?! Looks delicious, and I love the crunch of almonds too! Thanks!! I certainly can’t resist good brownies! Love me a good brownie. Then again, who doesn’t? And I know that the whole nuts vs. no nuts camps are pretty split, but I’ll take almonds in pretty much anything, pretty much any day. And anything with espresso gets my vote. Great recipe! I agree. Anything with espresso! 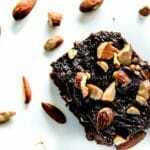 Riz, these brownies are totally inspired and look amazing! Beautiful work! Oooh! I’ve tested it out with walnuts, and I think it works pretty well! Hope you enjoy it too! I made your brownies, they were so delicious that I want to make them again. I loved the blend of dark chocolate and coffee. I used instant coffee but next time I will try with espresso. we enjoyed them a lot and they were all gone in no time. Great recipe, thanks. Brownies were on my list up next to make so your post was perfect timing as I think I’ll make yours. These look amazing!! Thanks for sharing. Oh yay! Perfect timing! Hope you enjoy them, Christy! Thanks for commenting Colleen, I agree the real butter frosting makes all the difference! I love espresso powder in baking! These look like the perfect treat for when the chocolate cravings hit. I do too, I think that the espresso powder brings out the flavour of chocolate in a way nothing else really manages to! Brownies are a weakness for me! There is just something so comforting about the fudgy first bite! Yes, absolutely! The first bite, the corner piece, full of chocolate and yumminess.